McMaster’s Anti-Violence Network and Indigenous Studies Program are observing the National Day of Remembrance and Action on Violence Against Women today on campus. There will be a poster exhibit in the ceremonial room of the Indigenous Studies office in L.R. Wilson Hall (Room 1003). The display, hosted by the Women + Gender Equity Network (WGEN), tells the individual stories of a selection of missing or murdered Indigenous women. 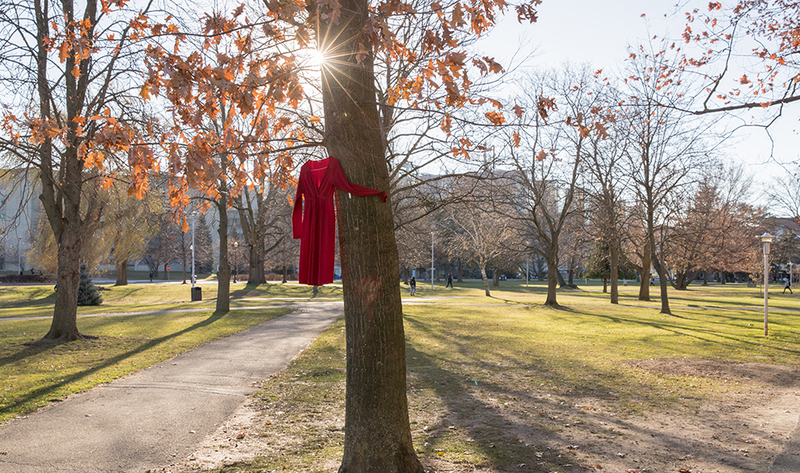 Red outfits have been placed at locations around campus as a symbol of remembrance. Gather at 10 a.m. at parking lot entrance to the McMaster University Student Centre. Each year, a group of men and male-identified people gather on Dec. 6 for a short walk around campus, stopping at various points to think about the 1989 massacre at École Polytechnique in Montreal, gender-based violence and violence against women and how these matters relate to us and McMaster. At each stop one volunteer takes a rose and places it at the commemorative marker and is invited to share why they are participating. Each stop is ended with a moment of silence. After the walk has ended there is a gathering for the Commemorative event.